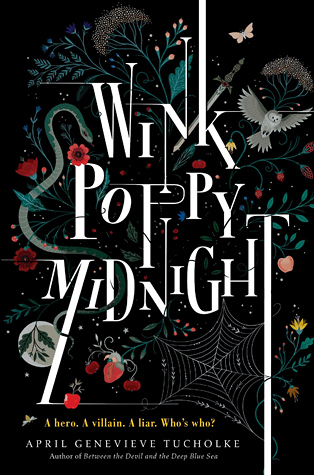 I finished Wink Poppy Midnight a few days ago and ever since then I've been debating what to say in this review. The one thing I'm sure of about this book is that it's really odd and I'm having a hard time figuring out to go from there, so bear with me. If I had to choose one character who I sympathized with most it would be Midnight who seems to be caught up in the middle of everything through no fault of his own. Poor Midnight seems to want to just live his life and be happy. Meanwhile, Poppy the Bully and Wink the Weirdo are both pulling him in different directions. Poppy wants Midnight for herself (or does she?) and Wink wants him to be the hero of her super weird fantasy world. I didn't quite get his romance with either of the female leads - one seemed incredibly unhealthy and the other seemed like an extreme case of insta-love. Unfortunately, I couldn't really love Midnight either and I have a hard time with books that don't make me feel close to any of the characters. The plot of this story is... weird. It's certainly very mysterious and I would expect no less from the author of The Devil and the Deep Blue Sea, but I'm not sure that it worked out quite as well in this book as it did in that one. The mysteries were so mysterious that, by the end, I honestly didn't know what was going on. I didn't understand why everyone ended in the place they did and why no one seemed to be mad at anyone who deserved it. The one thing I can say Wink Poppy Midnight really has going for it is its setting. Although the story was a little too weird for me, the author definitely made me feel like I was in the midsts of this kind of Southern, kind of fairytale(ish) setting. It achieved all the dreamy feels it was going for - I just wish more had been done with it than just spinning a super strange tale that left with more questions than were answered. I know this review may seem a little jumbled, but I'm not sure what else I can say without giving the story away completely. Even if I could include all the spoilers, I'm not sure I'd be able to get much across because that's just how weird this book was. I didn't hate it. In fact, I kind of enjoyed it at times. At the end of the day, though, I really couldn't identify with a single character and I was still really confused at the end. I have loved every other thing April Genevieve Tucholke has written, but this one just didn't do it for me.